It has long been known that Adolf Eichmann, Josef Mengele, Erich Priebke and many other Nazi war criminals found refuge in Argentina. In this book, a courageous Argentinian writer shows exactly how it was done, and reveals that the escapes were organized with the enthusiastic support of President Juan Peron. Even at this late date, when so much is known about the complicity of the Catholic Church and Allied intelligence agencies in the flight of the Nazis, Goni's material still has the power to shock. 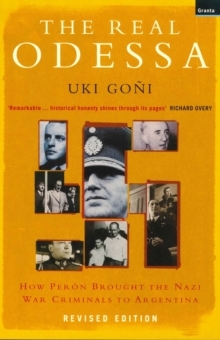 The paperback edition of The Real Odessa includes a revised introduction and conclusion, with a new afterword containing material that Uki Goni has recently researched and which focuses on Vatican complicity in providing sanctuary for war criminals.